It was filthy. Just raunchy! 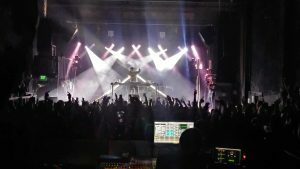 A nasty display of grimy bass was dripping off the walls at The Aggie Theatre in Fort Collins on April 3. Flosstradamus and Ill-Banks poured on the muck for the opening night of the Hdyfest Global Warning Tour. Flosstradamus is recognized as a Trap music pioneer out of Chicago. Their original blend of electronic and hip-hop paved the way for their musical success. Now a one-man wrecking crew, Floss kicks off his tour in Colorado and circles the globe through Australia and then back to the east coast in late July. Ill-Banks is a local Front Range favorite and Dubstep aficionado. He rocks those vintage Technics and lays down that old school scratchin’. If you’ve enjoyed the nightlife in Old Town Fort Collins you’ve probably come across his unique blend of Dubstep, Hip Hop and greatest hits from all genres that create a rather tasty bass salad. The beats poured out, and the crowd poured in. The Aggie filled up quick. Ill-Banks opened up the show with a sick Biggie remix of Runnin’ that introduced all the screw ups to his “ill-bass” game and the whole crowd blew up! Cheesy puns aside, Ill-Banks knew how to pump up the crowd and get the people movin’. It was like watching a mating dance for bass heads. The harder the bass, the more the crowd screamed. He’s been dropping beats along the Front Range for over a decade and has always been on point. He posted a shout out on social media stating, “that was one of my favorite sets of all times!” while also thanking his fanbase for their support. Based on the energy of the crowd that night, it would be hard to find someone there that disagreed. Ill-Banks even showed some love to his hometown roots when he dropped a bass track produced by, Nikko, a twelve-year-old hailing from Arizona, that was all kinds o’ wavy and sticky. Nikko is the son of a friend and the next generation of Dubstep and EDM. The crowd was electric from that point on. This was just in time for Flosstradamus to light up the show. Literally. An LED’s version of The Global Warning Tour logo, lit up the crowd. In response, the crowd threw up their hands making warning symbols of their own. It was like watching a mating dance for bass heads. The harder the bass, the more the crowd screamed. Floss worked up the crowd as he screamed “I wanna see you jump!” to his new single Bounce Back. Everyone went nuts when he threw down a remix of Every Time We Touch by Cascade. There really wasn’t a moment when a sick track wasn’t being dropped. Post Malone, Zombie Nation, Drake and even that “Night at the Roxbury” song drizzled out of the speakers wrapped up in an assortment of bass remixes. It was impressive.